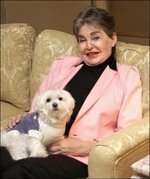 Leona Helmsley's $12 Million Dollar Dog. The public was incensed. Many death threats were aimed at Trouble, and while the public had no legal bearing on Helmsley’s post-mortem gift-giving, her family soon contested the will. The document was under judicial scrutiny for nearly a year before Judge Reena Roth ruled that Helmsley was mentally incompetent when she drafted the will. The $12 million reserved for Trouble was cut down to $2 million, with the remaining $10 million being distributed between two previously-excluded grandchildren and a charity. Leona Helmsley was the wife of real estate mogul Harry Helmsley, who managed large properties throughout New York City. She is succeeded by her brother and four grandchildren.